A wig cap is essential if you are going to wearing a wig! Going to a party, or on a crazy long night adventure of trick-or-treat, you definitely need to make sure that those locks of yours don’t fall off! Online Party City has a wig cap for only $2.99. If you are not a wig wearer then this is perfect, but if you like to wear wigs then go ahead and spend a little more, it will save you the trouble later on. Wigs are one of the main things that have a person stand out second to costume. I think that the wig pulls a look together like makeup on a normal day. Wigs are extremely amazing and if you see the picture above, how can you not want a wig that is so crazy it is amazing? Don’t be afraid to be a character for Halloween! Makeup is huge when it comes to Halloween! I definitely recommend getting a palette (if you are the only one you know dressing up) to go ahead and find the palette that will suit you most. Generally, there are themed makeup palettes that will have the necessities. I recommend if you are going with a ton of friends and are doing each others makeup, to make sure that you get a lot of makeup sponges and eyeshadow applicators so that you don’t spread germs! Of course, a costume is the MOST important thing that you can get for yourself and if you don’t have the money…improvise. I almost guarantee that you will find something that will suit your fancy. There are other items that are important to a costume and you are welcome to take these into consideration or ignore, but I think that the basics are better than the crazy things that you might not even need. Halloween is supposed to be fun! Be safe! That top costume scares me to death, is she a short order cook? 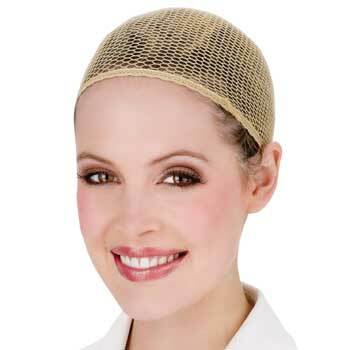 She is actually modeling a wig cap.